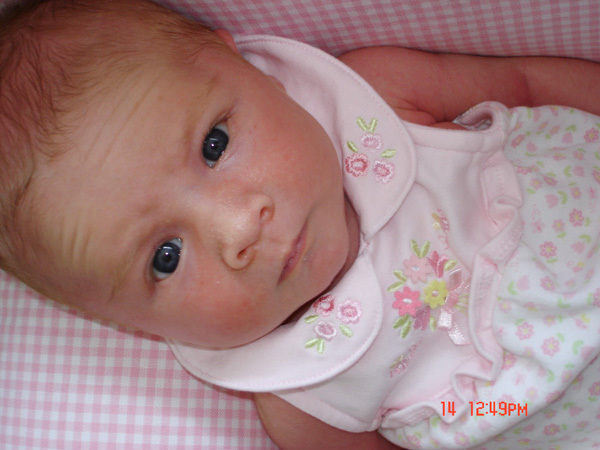 From the moment we first saw our daughter Cameron Lilly we knew she was an angel baby. The way she would light up the faces of her family, friends, and even strangers proved her angel spirit. We spent two wonderful months with our perfect angel before she was diagnosed at her two month check up. We are grateful for those carefree times with Cameron as a family. We were only moderately concerned when she could not hold up her head at two months, but as we watched her pediatrician examine her we could see in his face there was something very wrong. We were referred to many specialists who at first believed it may only be a muscular deficit and she could live a normal life. After visiting with a specialist in pediatric muscular disorders we were told she very likely had Spinal Muscular Atrophy Type 1 and would not live more than 18 months. We could not believe that the diagnosis was worse than our worst case scenario, it just never entered our minds that she would not be with us forever. Three weeks later a blood test did confirm what we were told to expect, that she did in fact have the rare genetic muscular disorder SMA1. We spent the first week crying until we had no more tears to cry, then decided to instead make every moment special with our daughter while she was with us, and mourn her when she is gone. Instead of asking how could this angel be taken from us so soon we choose to feel thankful for the most wonderful 116 days we spent with her. They truly were wonderful days. We spent everyday filling her life with joy and love. Cameron went on vacations, to the movies, out to meals, on walks everyday, to the pumpkin patch and scarecrow fest, shopping, had play dates, went to the beach, went swimming, felt the rain on her face, danced with her mom and dad, felt the wind and sunshine, and took a bath every night with her daddy. We lived each day as it was our last with her, and although it was so difficult to rejoice in her when we knew her time was short here on earth, what a wonderful way to live each day as it is the last. We never could spend the night more than a few inches away from her as she snuggled in bed with us or in her bassinet right next to her mommy. She spent almost every minute of every day held by her mom, dad, or loved one. We believe she had a wonderful life here with us, but that she has special work to do as an angel in heaven. Angel babies wake up the sun, paint rainbows and sunsets, throw shooting stars, and listen to wishes. This is not goodbye as we will meet her again in heaven. We know it is okay to be sad and to miss Cameron every minute, but… Children’s faces and moods are a reflection of our own so we have asked our friends and family to feel and show joy and peace in their faces for the wonderful life she had with us so as she looks down on us she will live in heaven with that reflection of peace and joy on her face. 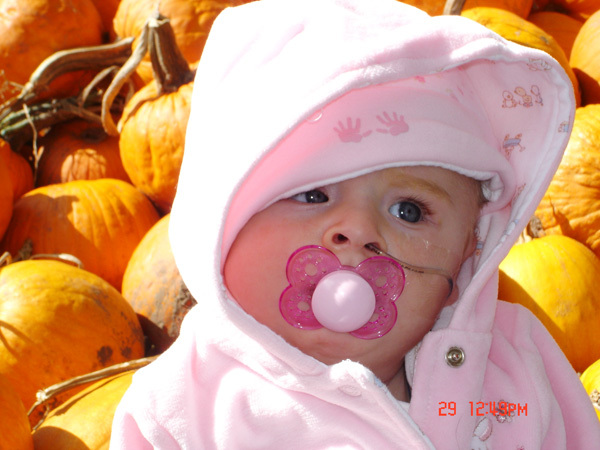 We want her to live on in heaven and in our hearts as a happy, peaceful, and free baby girl. We continue to surround ourselves with her pictures as they bring us joy. Seeing our friend’s babies grow, talking about Cameron, and seeing her pictures around all will bring us joy. Each day we miss her even more, but surrounding ourselves with friends and family and remembering Cameron as the angel baby she was bring us joy. From a poem a friend shared, “Our Father tests us often with suffering and sorrow…He test us not to punish us but to help us meet tomorrow…For every loss he sends us is followed by rich gain.” We have gained our own personal angel in heaven and we feel blessed. We were fortunate to have been put in contact with a family in Florida who lost a child to SMA1 and they were and continue to be a constant source of comfort to us. 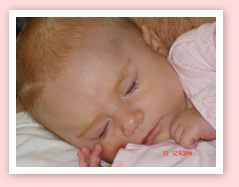 We could think of no way to repay them for their compassion, but to be a source of comfort to other families affected by SMA 1 and we will use the Angel Baby Foundation to do that.